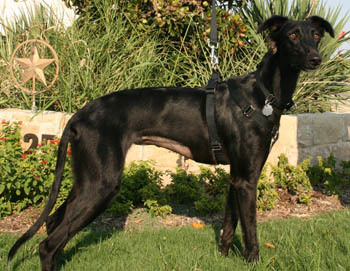 Selene is an untattooed, black female who is estimated to be about 1½-years-old. She was surrendered to a Harlingen shelter with a high euthanasia rate along with Doc and Heather. With the help of several volunteers, they were quickly pulled and transported to GALT on July 15, 2012. 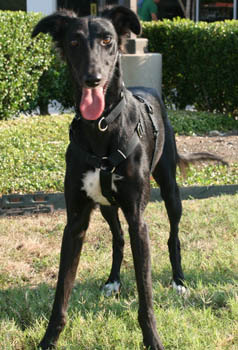 This cute girl with the fuzzy ears is likely a Saluki/Greyhound mix. Selene passed her inital cat test, but on spending more time with them decided they're too fun to chase and snap at. This "Selene" doesn't take after THAT "Celine" (Dion). She's a DANCER, not a singer! This young grey has a lot of puppy in her, and she loves to greet new people by hugging their necks and taking them for a spin on the dance floor. We are teaching her that not everyone loves to do the Texas 2-Step, however! She is learning to curb her enthusiasm a little without losing that puppy charm. "Wiggle Worm" is another nickname that comes to mind, as she has a lot of energy and loves to play -- especially with her stuffy toys and squeakies! In less than 24 hours, this black beauty with the gorgeous white socks learned to sit for treats -- and she gets along great with her two foster siblings. In a very short time, she seems to be getting the hang of house training. This petite girl has the cutest furry ears and tail -- and how can you resist those big brown eyes?